Marvel anti-hero, The Punisher, is taking another shot this week, and not the good kind. 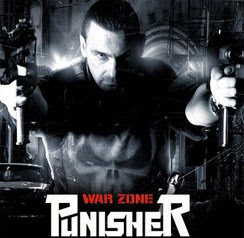 This year’s sequel, Punisher: War Zone, already had several things working against it - a crappy first movie, a lack of any names returning from the first movie, and recently rumors that director Lexi Alexander had been removed from her own picture. Now it sounds like the movie is about to get dumbed down a bit - a fatal flaw for a hero like Frank Castle, the Punisher. Latino Review says they have it on good authority that Lionsgate is looking for a PG-13 edit of Punisher: War Zone, cutting down violence and bloodshed, elements that are essential to the kind of hero the Punisher is. Just look at his name - “The Punisher”. He punishes people! That doesn’t mean he puts them in the corner or makes them mop floors. He kills, maims, and tortures people. The kind of thing that doesn’t play well in a PG-13 flick. The suggestion is the desire for the lower rating is prompted by the success of The Dark Knight, which somehow managed to pull off a PG-13 despite some pretty gratuitous content. We’ve all admitted it’s the darkest Batman flick ever and probably deserved an R. Lionsgate is likely eyeing the success of that movie and figuring they can do the same with Punisher, despite the fact that Punisher should be even darker than Batman. Don’t get me wrong, a PG-13 rating for War Zone would be a terrible mistake, but at the same time, it’s not a death knell. Live Free or Die Hard and The Dark Knight pushed the edge of the PG-13 rating, making it work without ruining their story. But they had a good story first, and I’m not confident War Zone does. Meanwhile, the first Punisher movie was rated R and totally misused that rating. Castle’s entire family gunned down and not a drop of blood to be seen. I haven’t had high hopes for Punisher: War Zone and Lionsgate certainly isn’t doing anything to alleviate those concerns. I’m guessing the next move for the picture is a drop down to direct-to-DVD status, which is pretty much what most of us were expecting from the film in the first place.